On the 5th (Wed), pause for some photo ops at Adiyogi Shiva and then take in the spiritual surroundings of Dhyanalinga Temple. Here are some ideas for day two: take in the spiritual surroundings of Marudamalai Temple, take in the spiritual surroundings of Arulmigu Patteeswarar Swamy Temple, pause for some serene contemplation at Infant Jesus Church, then take in the spiritual surroundings of Eachanari Vinayagar Temple, and finally pause for some photo ops at Narayana Kavi Memorial. To find where to stay, traveler tips, ratings, and tourist information, you can read our Coimbatore trip website . Pune to Coimbatore is an approximately 2.5-hour flight. You can also drive; or take a bus. In June, plan for daily highs up to 38°C, and evening lows to 27°C. Finish your sightseeing early on the 6th (Thu) to allow enough time to drive to Kalpetta. Kick off your visit on the 7th (Fri): Head underground at Edakkal Caves, then see human ingenuity at work at Padinjarathara Dam, and then take in the awesome beauty at Kurumbalakotta. Keep things going the next day: explore the activities along Pookot Lake, then take your sightseeing to a higher altitude at Banasura Hill, and then admire the engineering at Banasura Sagar Dam. To see photos, more things to do, ratings, and more tourist information, read Kalpetta day trip tool . Traveling by car from Coimbatore to Kalpetta takes 3.5 hours. Alternatively, you can take a bus; or take a bus. Expect a daytime high around 35°C in June, and nighttime lows around 28°C. Finish up your sightseeing early on the 8th (Sat) so you can travel to Mananthavady. Kick off your visit on the 9th (Sun): take in the exciting artwork at Valmeekam Clay Art Gallery, then make a trip to Thrissillery Shiva Temple, then take in the spiritual surroundings of Valliyoorkavu Bhagavathi Temple, and finally take your sightseeing to a higher altitude at Korome Mosque. To see photos, where to stay, reviews, and other tourist information, read our Mananthavady route planner . Drive from Kalpetta to Mananthavady in an hour. June in Mananthavady sees daily highs of 35°C and lows of 28°C at night. Cap off your sightseeing on the 9th (Sun) early enough to travel to Pothamedu. On the 10th (Mon), take in nature's colorful creations at Rose Gardens, then take in the architecture and atmosphere at C.S.I Christ Church, then admire the engineering at Mattupetty Dam, and finally take in nature's colorful creations at Tea Gardens. On the 11th (Tue), you'll have a packed day of sightseeing: take in the dramatic scenery at Keezharkuthu Falls, take in the awesome beauty at Ottakathala Medu Mountain Range, then see the interesting displays at Tea Museum, and finally take some stellar pictures from Pothamedu Viewpoint. To find photos, more things to do, traveler tips, and other tourist information, read our Pothamedu trip planner . Traveling by car from Mananthavady to Pothamedu takes 10 hours. In June, daily temperatures in Pothamedu can reach 35°C, while at night they dip to 28°C. Cap off your sightseeing on the 11th (Tue) early enough to go by car to Kochi (Cochin). 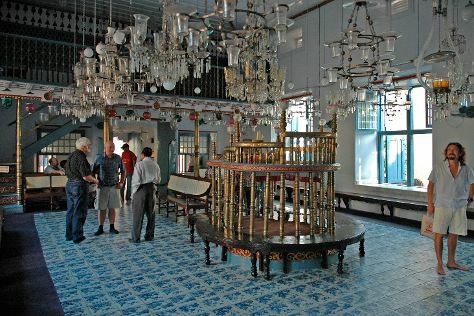 On the 12th (Wed), take in the spiritual surroundings of Mattancherry Palace, take in the spiritual surroundings of Paradesi Synagogue, then take a stroll through Jew Town, then admire all the interesting features of Kerala Kathakali Centre, and finally make a trip to Chinese Fishing Nets. Discover how to plan a Kochi (Cochin) trip in just a few steps with Inspirock's itinerary builder. Drive from Pothamedu to Kochi (Cochin) in 4 hours. Expect a daytime high around 36°C in June, and nighttime lows around 28°C. Cap off your sightseeing on the 12th (Wed) early enough to travel back home.